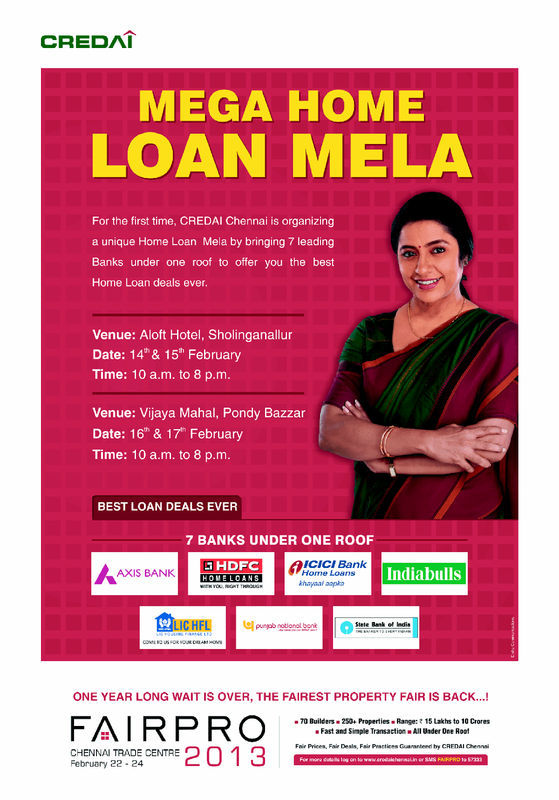 Leading up to the annual FAIRPRO 2013 event, CREDAI (Confederation of Real Estate Developers' Association of India) Chennai is organizing an home loan mela from 7 participating housing finance companies. Having representatives from all the participating housing finance institutions under the same roof, it should be easy for customers to compare the options available, shortlist the ones which match their requirements and to finalize the loan for further processing. Knowing about their eligibility and having an "in-principle" sanction of loan should provide clarity for the new home loan customers, as to what budget they can afford before they go in for the FAIRPRO 2013 event. Keep track of our blog for more news on CREDAI Chennai's FAIRPRO 2013.